Known as the Treasure of the Val d’Arly, Notre Dame de Bellecombe combines the quaint appeal of an alpine village with the facilities of a thoroughly modern ski resort. Located in the Savoie region between the Beaufortain and Aravis ranges and overlooking Mont Blanc, Notre Dame de Bellecombe is part of the famous Espace Diamant, an amalgamation of five premier ski resorts. Close to some other top resorts like Flumet and Crest-Voland, this beautiful hamlet is an incredible mountain escape away from the hustle and bustle of city life. With a rarely changing local population of around just 500 people, Notre Dame de Bellecombe is small, relaxed, and peaceful with the combined feel of an exclusive resort and a warm and welcoming community. Whether you’re looking for a tiny flat or a huge family home, the sublime views, wonderful hospitality and, of course, excellent skiing make this a prime spot for investment. As one of the major pastimes of the region, skiing opportunities are in abundance around the resort. There are over 132 kilometres of ‘easy’ slopes, making it a perfect destination for beginners. As such, Notre Dame de Bellecombe is an ideal place for the whole family, as ski fans of any age can learn or develop here. 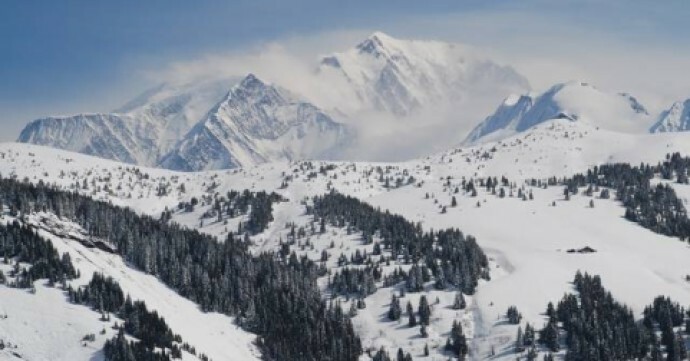 More experienced skiers can enjoy 60 kilometres of intermediate and expert slopes, with Perdix and Les Pres classed as black runs for the highly ambitious. There are many bars and restaurants at the base of the resort and some friendly, family-run eateries right on the slopes; handy for full days spent skiing. According to our annual snow report Notre Dame de Bellecombe enjoys regular falls of ‘new’ snow with an average mountain snow level of 85cm and a mean base level in the valley of 44cm. For more snow and weather updates, take a look at our Notre Dame de Bellecombe resort guide here. A true winter wonderland, younger children can enjoy ‘baby snow’ events specifically designed to encourage toddlers to ski, before warming up with a mug of hot chocolate. Older kids and grown-ups can experience the unique wonder of dog sledding, led by trained professionals. Life in Notre Dame de Bellecombe can be as thrilling or as relaxed as you want. Indulge in adventures like paragliding and horse riding or enjoy some retail therapy at the local markets and festivals. Notre Dame de Bellecombe is a traditional mountain town with something for everyone. When buying a property in Notre Dame de Bellecombe it’s great to know that you’re investing in a resort that’s full of character and excitement. The village itself is built around a stunning baroque steeple which is just one of many examples of traditional architecture. The entire area is rich in culture with locals organising events to showcase this, such as the annual week of Saint Vincent every January. This culinary celebration week includes food tasting, traditional dancing, and many more opportunities to learn about the cuisine and heritage of the Savoie region. More unusual events include ‘skiing with eagles’, where guests can watch raptors, vultures and falcons fly majestically down the slopes. Other highlights include torchlit descents of the mountains, and movie nights, so there’s something for the whole family. In the nearby village of La Clusaz, there is the tiny and perfectly preserved chapel Col des Aravis, while in summer walkers can roam the green and verdant forests and meadows of Mégève. Living in Notre Dame de Bellecombe is peaceful and exciting in equal measure, and full of surprises in both summer and winter. Investors looking for property will find everything from two bedroom flats at the foot of the slopes, to huge renovated farmhouses echoing the style of traditional chalets. 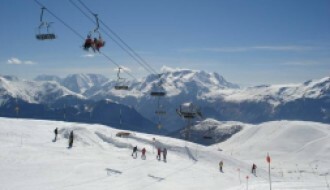 A relatively new addition to the resort is an hour's free ski induction with the use of a private ski-lift. Over 200 visitors came to take advantage of this offer in one season, showing how positively this has boosted the local economy. As the resort is now part of the prestigious Espace Diamant, it benefits from all the funds spent on maintaining the infrastructure of this popular ski-area, including a boosted profile across social media platforms and a wide range of cultural activities. 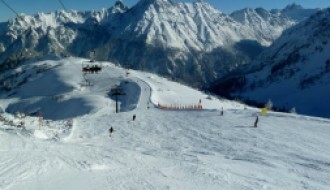 In the typical weather report Notre Dame de Belle enjoys plenty of sunshine in the summer months, with regular snowfall ensuring the slopes are regularly topped up. Temperatures can reach 25 degrees or above in July, meaning there’s plenty of opportunity to get out and about and enjoy the surrounding natural beauty. Notre Dame de Bellecombe is about a 90-minute drive from Geneva Airport, crossing the border from Switzerland into France. There are also regular bus transfers from the airport, and local roads connect the resort to nearby towns and hamlets. 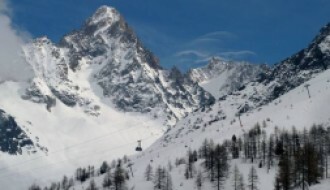 All the nearest villages are also connected by ski lifts. Car parking is available off the roads that access the ski slopes. Many of these are well placed for nature walks as well as enjoying the skiing. Hospitals and schools are just minutes away wherever you are in the resort, giving you peace of mind when you’re thinking about investing in this area.